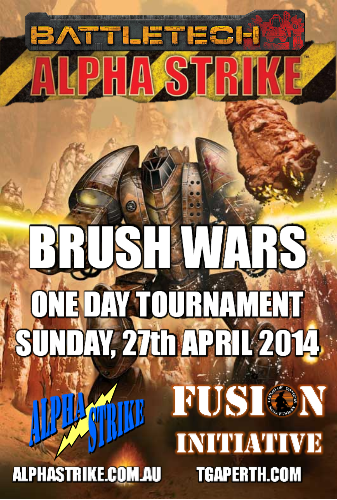 The very first BattleTech: Alpha Strike tournament in the history of Perth happens right here at Tabletop Gamers Association on Sunday, 27th April 2014. Players will not only get to play what is becoming one of the fastest growing versions of BattleTech, but also the chance to win some exclusive Alpha Strike swag! All the information needed to register for this tournament can be found in the official player pack. Catalyst Games Labs Demo Team Member #139: BattleTech FTW! www.alphastrike.com.au - Perth's premiere games and hobby supplier. Getting my force for this ready now. Saw this on the weekend, and can definitely see the appeal of this system over classic B'tech, especially as you were playing with the classic 3025 'mechs (which I still have in storage). Well we are off to a good start. Earlier this year I made a basic YouTube video of a demo game of BattleTech: Alpha Strike that took place at Tabletop Gamers Association. Although it does'nt go into detail about the rules it is a great little watch for those people curious about the game in general. I'm trying to see if I can make it to this, but it doesn't look likely unfortunately. Nihil declarandum, die dulci freure!